Scared To Give Birth? Beat The Fear Of Childbirth With These 8 Tips! Inside: If you’re nervous about labor and delivery, these tips will help you overcome the fear of childbirth! How bad will it hurt? Will I split in two? Will I be in labor forever? Will I be pushing forever? Can I even do this or will I need a C-section? The fear of childbirth is real! But it’s natural to have fear because labor and birth are an unknown and anything unknown is scary! Especially when it has to do with your health and the health of your baby. So here you are, pregnant and nervous about what’s about to go down on delivery day. I also had fears about what would happen when I gave birth. But I’ve been through this process now twice and come out of it with two natural unmedicated home births. These are the best tips I can give you to look fear dead in the eye like the badass mother you are, and have the birth you want! This was hands down the best decision I made and definitely helped me to have two natural home births. The whole purpose of a natural childbirth class is to help you have a healthy pregnancy, understand what happens to your body and baby during labor and delivery, and gives you tons of information about the birthing process so you can make informed decisions. There’s a lot more you get with a natural childbirth class but it’s so comprehensive I can’t even list it all here. This is a wonderful online natural childbirth class you and your partner can take in the comfort of your own home! I’m sure that’s the top fear for everyone! It’s so hard to imagine what it’ll feel like when you’ve never given birth and with the way labor and delivery are portrayed on T.V., it’s a wonder anyone has a baby! They practically breed fear into you with how painful the media makes it look. I’m not saying it’s painless, but there are ways to cope with labor pain naturally to tolerate it, if your goal is to have a drug-free labor and birth. You’ll want to make sure you’re practicing your relaxation techniques ahead of time because if you’ve never practiced before labor, they probably won’t work. I remember when a friend of mine gave birth for the first time. She had no idea what was happening, had no idea if she was allowed to tell her healthcare providers she didn’t want certain procedures done, and what ended up happening is labor and birth happened to her instead of her experiencing childbirth. She didn’t have any control in her labor and delivery and ended up having a traumatic experience. You can take control of your birthing experience by making these decisions before labor begins. Once you’ve made these decisions, you can put them all together in a birth plan. A birth plan gives your healthcare provider, doula, partner, (basically anyone you want to give one to) a clear idea of how you want your labor and delivery to go. Read here to find out how to write a birth plan and why you need one. This was the second best thing I did to help myself have two natural unmedicated deliveries. A certified doula is a trained professional who supports a mother before, during, and after childbirth to ensure she has the best possible birthing experience (source). They’ll support your birth plan and advocate for you with your healthcare providers when you can’t, (like when you’re going through contractions). They also have a lot of tools to help move you through labor so even when you think you can’t go through one more contraction, they can get you to ride it out. Of course if you decide you want medicine or another intervention, they’ll support that too. They’re there to help you have the best birth experience possible. One of the other biggest fears is thinking you’ll tear horribly and you’ll never be the same down there. However, there’s lots of things you can do to prevent tearing during childbirth. Also keep in mind that while tearing sounds really scary, it’s usually better than the alternative of an episiotomy. Giving birth is a physical event for sure! So you have to keep your body in good shape for delivery day. Make sure you’re eating healthy and exercising as this can also speed up how fast you give birth! It’s pretty much the horror of every woman who’s going to give birth. No one wants to face that vulnerability when you poop in front of strangers! It’s not always a guarantee that’ll happen to you because lots of times when you’re in labor, you’ll poop a lot, (before you’re pushing the baby out). It’s one of the ways your body is preparing for delivery. Even so, it does still happen to lots of women. Doctors, nurses, doulas, and midwives are used to it. In fact, they actually say that’s a good sign because that means the baby’s head is moving down! Plus, when you’re in labor it’s highly unlikely you’ll notice anyway. The pressure you feel when you’re having a baby pretty much feels like you’re taking a giant poop. If you’re super worried about it, you can eat lighter meals around your due date to possibly prevent that from happening during delivery. If your goal is to have a natural unmedicated labor and delivery, the thought of having a C-section is scary! I was terrified that I would end up having a C-section. I knew if something was wrong with me or the baby I would absolutely have one, but the fear was still there. It’s major surgery so the recovery process is longer and I was worried a lot of the items I had on my birth plan wouldn’t happen if I had a C-section. Also talk with the hospital you’re giving birth at, (or the hospital you’d go to if you’re scheduled to have a home birth and end up needing to have a C-section) and find out what a typical C-section looks like. 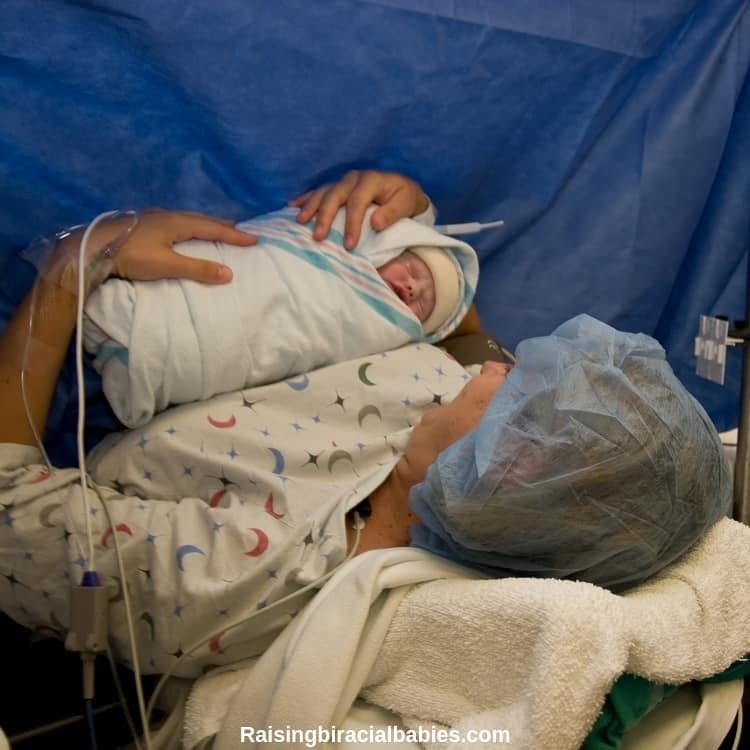 Plenty of hospitals now have a more mom-baby centered approach with this type of birth. For example, they allow moms to have skin-to-skin with their baby immediately after a C-section and they allow the dad to be with the baby. There’s never a sure thing when it comes to labor and delivery because it’s an unknown. The unknown breeds fear. But you can squash that fear of childbirth by becoming as educated as possible so you can make informed decisions and have a positive birth experience!